It began like a fairytale amidst mint juleps and magnolias in Mississippi. But as their love grew, its fruit flourished and spread to a most unlikely place - across the mission fields of Africa. The Yankee Officer and the Southern Belle is the vivid recollection of how God called Nell and Jack Chinchen from the comforts of their "perfect" life to a risky, lifelong journey they would never regret. More than forty years ago, the Chinchens arrived in Liberia, West Africa, as missionaries. They had left family, thriving ministries and a successful business. Their new life in the jungle would bring perils: tropical diseases, witch doctors, fire and even rebel invasion. Yet joy overflowed in their faithfulness to God's call - training pastors, teaching children, pioneering medical ministry. And their work wouldn't stop at the boundaries of their bamboo mission station. As the ministry expanded, God led the Chinchens to establish African Bible Colleges and Radio ABC, sending the Gospel across the continent. Looking back now, as the Chinchens live and work in Malawi, Nell is certain about the author of her story. "Africa," she says... "the place that God had written on my heart before the foundation of the world." 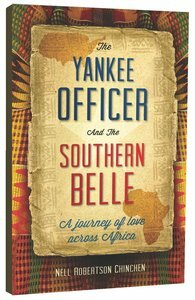 About "The Yankee Officer and the Southern Belle"
Nell and Jack Chinchen left the comfort of life in the United States to become missionaries in Liberia, West Africa. This is their story.